The notoriously failed Kimia II operation in eastern Congo has ended today, December 31. Soundly and forcefully criticized by Human Rights groups for the devastation it wrought on civilian populations, it will be replaced sometime in January with a new mission, dubbed Operation Amani Leo, sources say. North and South Kivu commanders Colonel Bobo Kakuji and Colonel Delphin Kahimbi will have their respective operation zones closed, according to information received from sources close to MONUC. Former Nkunda loyalist Colonel Makenga Sultani will lead a military sector, and this will hopefully reduce and or limit the influence of wanted war criminal Bosco Ntaganda who has established a parallel government administration in Masisi territory, sources add. It was Ntaganda who orchestrated the military coup against CNDP General Laurent Nkunda in January 2009. In addition, 180 CNDP casualties from the last years of fighting have been relocated into barracks in the Katindo neighborhood 5 km from Goma and at the Himbi District of Goma under the auspices of the "Social Affairs" advisor to Governor Julien Paluku Kahongya, Theophile Mpabuka. A former CNDP official, Mpabuka was kidnapped by Mai Mai at the Kiwanja massacre in November 2009.The Mai Mai executed two of those in custody, tried to kill two others who managed to escape, and released Mpabuka in return for a promise of ransom. The goal of the transfer of the CNDP combatants is said to be so that Ntaganda should "have no reason or pattern" to continue his illegal collection of taxes at the villages Kilolirwe and Mushaki" in Masisi territory. This potential shift in personnel, combatants and allegiances coincides with the end of a controversy-plagued UN peacekeeping mission in the Democratic Republic of Congo (MONUC). A twelve-month extension was changed to a five-month mandate, which will require additional UN oversight. The Security Council approved the resolution to impose the mandate on December 23 after reviewing the recommendations of the Panel of Experts. (See Final Report) The Council also requested that UN Secretary General Ban Ki-moon submit a review by April 1. Although critical of MONUC's role in abuses endured by the civilian populations in eastern Congo, Human Rights Watch cautions that troops should not be withdrawn until some kind of safety mechanism is in place. "The civilian cost of the current military operations in eastern Congo has been catastrophic," said Georgette Gagnon, Africa director at Human Rights Watch. "The secretary-general should ensure that MONUC's new mandate is implemented in a way that ensures peacekeepers do not find themselves aiding those who are committing war crimes." Human Rights Watch called for MONUC's conditionality policy that sets out conditions for the mission's support to Congolese army units to include the removal of Congolese army commanders with a documented track record of grave human rights abuses. Al Jazeera, the only news organizations with consistent video and reports coming out of DRC, released this video today. It sums up the conflict, the spin, and the effect upon the civilian population. If you do nothing else today, watch this report. So what does this all mean? In Congo, nothing is certain, but if ground reports pan out it does indicate that Bosco Ntaganda has outlived his usefulness to the regime of Joseph Kabila. "Regime" is a loaded word, but to call the failed state of DRC a "government" seems to fly in the face of reality there. When Ntaganda engineered a coup against the commander of the CNDP rebel group in January 2009 because of a secret deal negotiated between former enemies in the capitols of Rwanda and DRC, the CNDP was expected to integrate with the Congolese army (FARDC). Talk to the United Nations Mission in Congo (MONUC) or Nkunda loyalists, and the answer morphs from completely integrated to up to 90 percent remaining loyal to Nkunda. According to human rights groups, Ntaganda became the region's worst nightmare, setting op a parallel administration in Masisi territory. Ntaganda had expected the government of the DRC to negotiate his warrant arrest by the Hague, however the outcry from human rights organizations and especially support from Secretary of State Hillary Clinton for his arrest made that impossible. A hardened rebel fighter, Ntaganda won the support of the Congolese government by retaining control of the region as well as some operational successes. That is not all he accomplished. The report of the UN Panel of Experts on DRC details pilfering of funds earmarked for soldiers' salaries, illegal timber harvesting and sales, smuggling across the Ugandan border at Bunagana, and collusion with the Rwandan rebel army (FDLR). The humanitarian havoc wrought by the FDLR in eastern Congo was the impetus for the disastrous joint Rwanda/DRC operations in the first place. It has become exponentially worse as detailed in human rights reports. Meanwhile, sources say Ntaganda has taken his ill-gotten wealth and purchased buildings, cars, motorcycles, cows, and even a fuel station in Goma. The fuel station should raise some eyebrows. Ntaganda has taken advantage of the frustrations of rebel groups in both North and South Kivu provinces that promises made by the DRC government of Joseph Kabila in March 2009 have not been fulfilled. In order to protect himself, Ntaganda has formed a political collective, CPC, with the support of Ugandan Tutsi generals to fight FARDC. 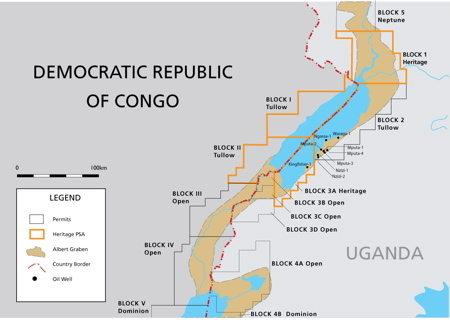 The alleged goal is control of an oil rich zone along the Ugandan border which falls within the confines of Virunga Park, from the Mabenga Bridge on the Rutshuru River to the Ishasha custom station. Here is where it gets really interesting. According to sources, Heritage Oil made a secret visit to the Kasoso stream near the Nyakakoma fishing village. Heritage Oil is the same company that exploited oil in Ituri during 2003-2004. Now, sources say that in Goma, Beni and Butembo, petrol with a "light red color, totally different from the petrol normally imported from Kenya," is being sold. Government sources confirm that Dominion Oil has also been exploring in the same corridor. The Congolese Ministry of the Environment has ensured UNESCO that there will be no oil exploration within Virunga, but exploration maps tell a different story. A consideration of the roles of Colonel Bobo Kakuji and Colonel Delphin Kahimbi, and the introduction of Colonel Makenga Sultani to a possible command position is also in order. Kakuji has been the operational commander for Kimia II in North Kivu since March, where many of the atrocities against civilians have occurred. Kahimbi is the Deputy Commander of the Forces Armees de la Republique Democratic du Congo (FARDC) in North Kivu. According to section 184 of the Report of the Panel of Experts, Sultani is a very interesting choice if he assumes command of a military sector. According to interviews with several members of CNDP in the Democratic Republic of the Congo and Rwanda, the decision to remove General Nkunda caused a division within the CNDP officer class, many of whom felt betrayed by General Ntaganda and remained fiercely loyal to General Nkunda, notably Colonel Sultani Makenga, formerly the third most senior officer in CNDP. 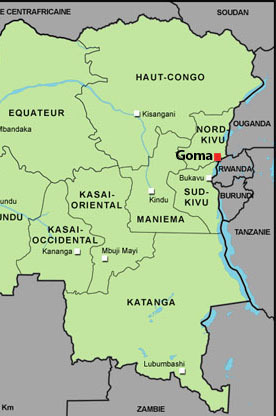 In particular, these divisions culminated in a near shoot-out between rival factions of CNDP at the Grands Lacs Hotel in Goma on 5 June 2009, following an argument over the control of the smuggling of timber sourced from Rutshuru and Masisi territories through the Bunagana border post. Active CNDP elements have informed the Group that these internal divisions are still significant, although there have also been moves by top CNDP political and military figures to bridge these divides. A fuller discussion of these political movements will also be outlined in the present section of the report. If all of this unfolds as sources predict, will the "divides" be "bridged?" Or is this an occult move by the Kabila government to sit back and see who ultimately becomes the winner in a war that has claimed six million? With Big Oil now in the mix, it is anyone's guess and everyone's fear. Researcher Sarah Markworth contributed cross-referencing with UN documents to this report.